Background: The causes of obesity are multifactorial and may include dysregulation of certain genes, such as peroxisome proliferator activated receptor gamma (PPAR gamma). When activated, the PPAR gamma pathway promotes lipid metabolism. This study uses microarray technology to evaluate differential gene expression profiles in obese patients undergoing bariatric surgery versus non-obese controls. Methods: Blood samples from six morbidly obese patients and four non-obese individuals (controls) were stabilized into PaxGene tubes (PreAnalytiX) and total RNA was extracted. 100ng of the total RNA was amplified and labeled using the Ovation RNA Amplification System V2 with the Ovation Whole Blood Reagent (NuGen) before hybridizing to an Affymetrix Focus Array containing over 8500 verified genes. The data were analyzed using an ANOVA statistical analysis (p < 0.05) within the GeneSpring. 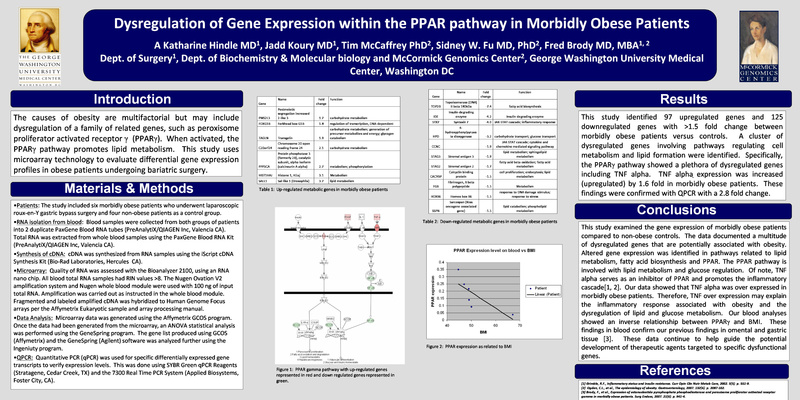 Using the Ingenuity program, potential pathways were identified and real-time quantitative RT-PCR (QPCR) was used to validate the array data. Results: We identified 97 upregulated genes and 125 downregulated genes with >1.5 fold change in obese patients versus controls. Interestingly, a cluster of dysregulated genes regarding cell metabolism and lipid formation were identified. Specifically, the PPAR gamma pathway from obese patients showed an increased number of genes that were dysregulated including TNF alpha. TNF alpha expression was increased by 1.6 X in obese patients. This upregulation was confirmed with QPCR and showed an increase of 2.8 X. Conclusions: Microarrays are a powerful tool to identify biomarkers for obesity by analyzing differential gene expression profiles. Although obese individuals have an overwhelming preponderance of fat, many genes and their respective products are dysfunctional. These dysfunctional genes engender a cascade of pathophysiology that contributes to the complications associated with the metabolic syndrome. Our unique blood analyses confirm previous tissue data from our lab and shed new light on the ensuing cascade of gene dysfunction associated with obesity.